David Anderson joined SUN Limited, based in Mauritius, in February 2016 as Chief Executive Officer, bringing some 25 years’ experience in the hotel industry. Prior to joining SUN, David served as Regional Vice President of the Wyndham Hotel Group, directly managing a portfolio of 182 hotels across 5 brands and before that as Managing Director of Dolce Hotels and Resorts, a respected leader in the meeting and conference space and luxury accommodation, where he served for four years. The Wyndham Hotel Group acquired Dolce Hotels & Resorts in April 2015. 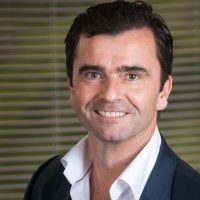 Prior to joining Dolce Hotels & Resorts in January 2012, David served as Vice President of Operations of Northern Europe at Louvre Hotels Group, where he spent 16 years. Aged 50 and a British Citizen, he holds a BA Honours in Business Studies with French from London Metropolitan University.